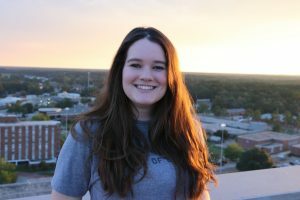 Taylor McCoy, ’18, chose finance on whim. 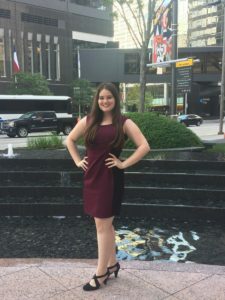 That quick decision made during Orientation before starting her freshman year set in motion a string of chance encounters leading to her position at a Fortune 500 company today. To McCoy, finance was “fun math,” and she loved the idea of using math to help people and companies. She was able to hone her financial skills in Ray’s Financial Trading Room—an experience she noted was not a class, but a job. McCoy was part of the first cohort to utilize the Trading Room’s advanced technology to plan the initial investment from the Student Managed Investment Fund (SMIF). It was during this class that she met fellow College of Business alum Randy Fowler, ’78, MBA ’91, who provided the initial seed capital for the SMIF. Fowler was back on campus to celebrate the ribbon cutting of the College’s new wing and stopped by the Trading Room to check on the SMIF’s progress. A week later, Enterprise Products flew McCoy to Houston for an interview at their headquarters. Today, McCoy serves as an analyst of liquids volume control at Enterprise Products, one of the largest publicly-traded energy partnerships, where she works to balance accounts and reconcile inventories, checks contracts, and schedules movements for distribution — work she was well prepared to take on.